Ms. Robinson grew up in Brooksville and attended Brooksville Primary, Mitchell L Black Elementary, Parrott Middle School and Hernando School. She is also currently attending PHCC. 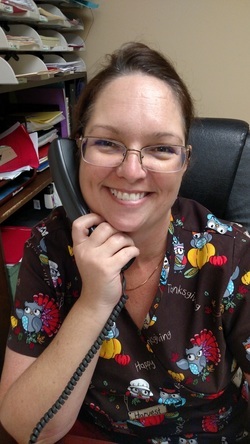 Ms. Robinson has been part of the Parrott family for 8 years and currently works in the clinic providing medical assistance to our little leopards. Prior to that she volunteered for us on a regular basis. Before coming to Parrott Ms. Robinson spent 2 years as the PTA president and 1 year as the SAC president at Brooksville Elementary. She has also worked as a bookkeeper and did some catering. Ms. Robinson loves being part of the Parrott working family and certainly knows the value of our volunteer staff. Most of the time you can find her in the clinic helping our wounded leopards or in the cafeteria doing lunch detention. An interesting thing about Ms. Robinson is that she loves to cook and is truly gifted in this area! Many of us who were lucky enough to try her pulled pork and homemade pies recently can attest to that for sure.